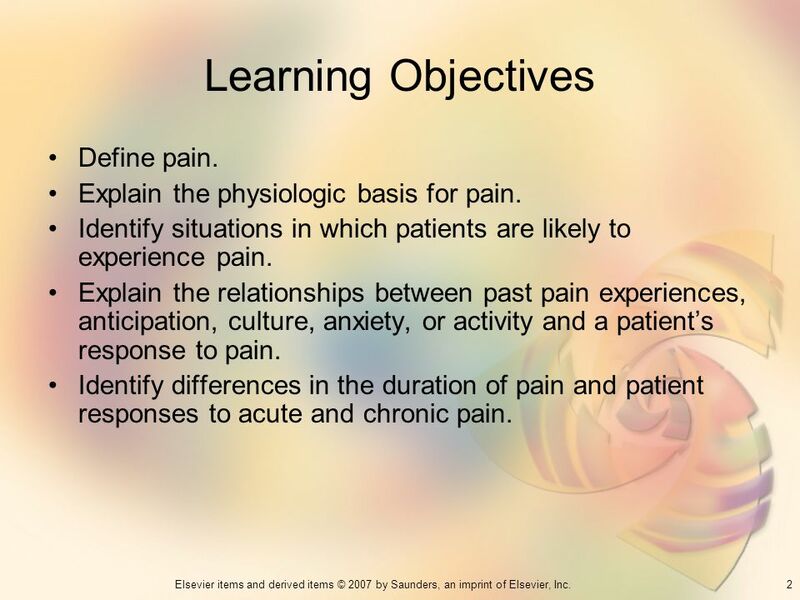 2 Learning Objectives Define pain. 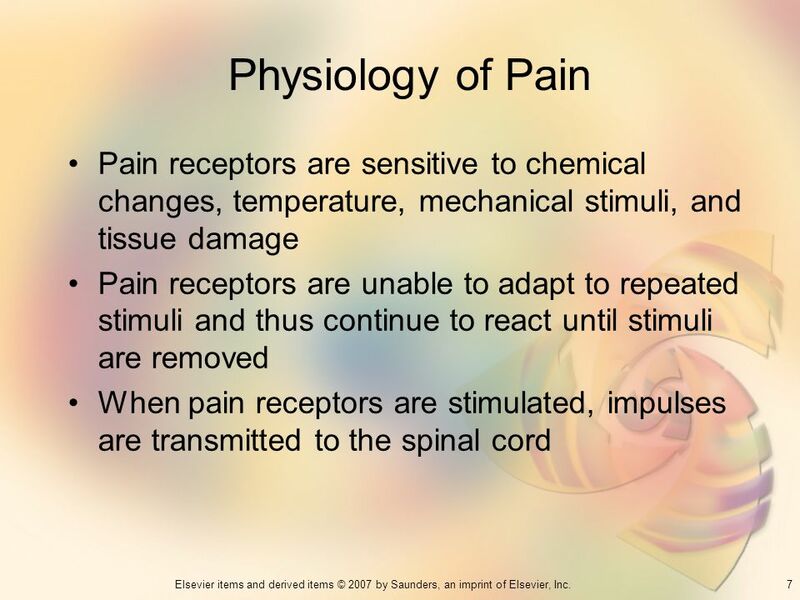 Explain the physiologic basis for pain. Identify situations in which patients are likely to experience pain. Explain the relationships between past pain experiences, anticipation, culture, anxiety, or activity and a patient’s response to pain. 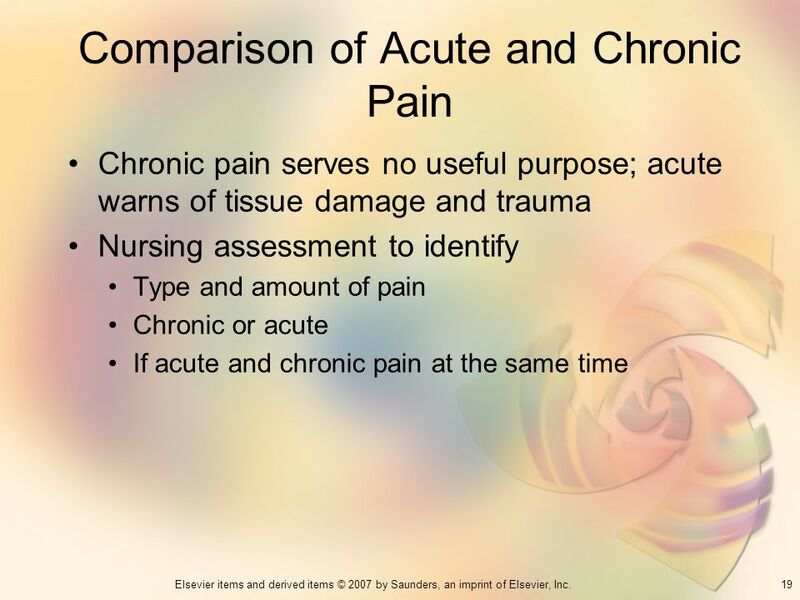 Identify differences in the duration of pain and patient responses to acute and chronic pain. 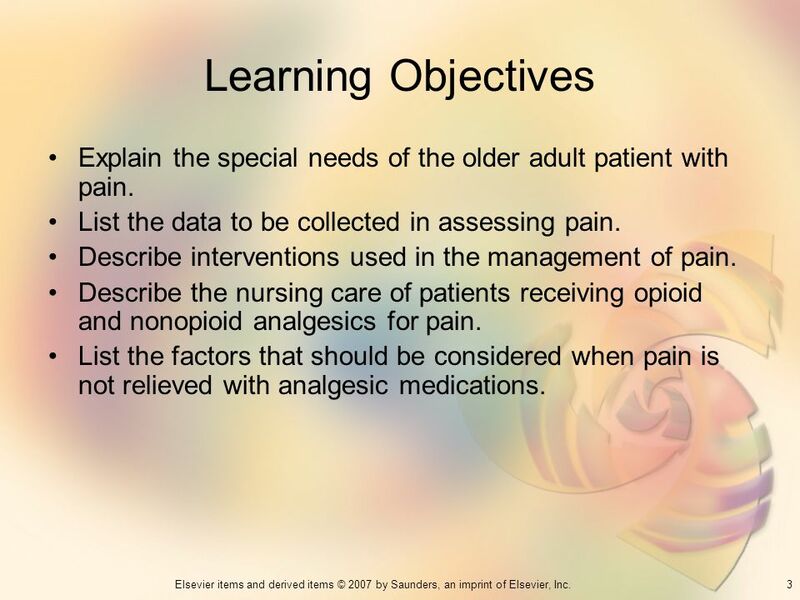 3 Learning Objectives Explain the special needs of the older adult patient with pain. 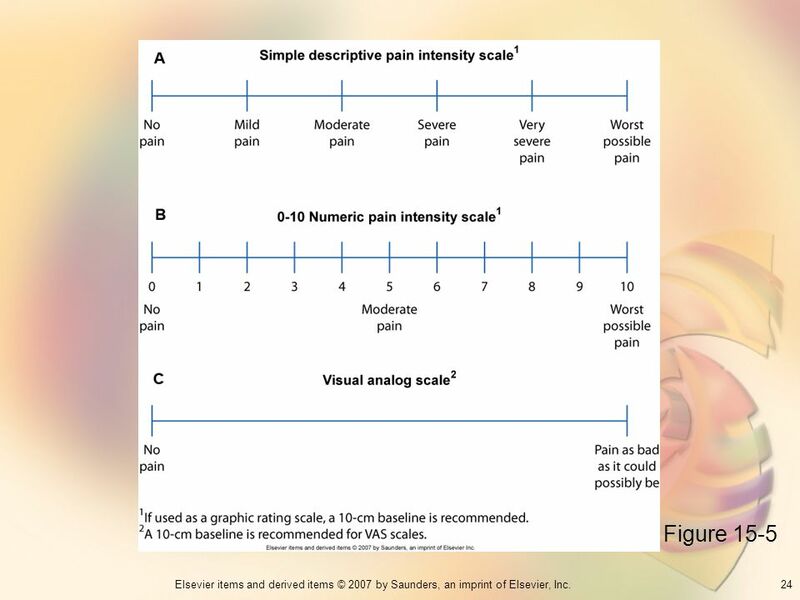 List the data to be collected in assessing pain. 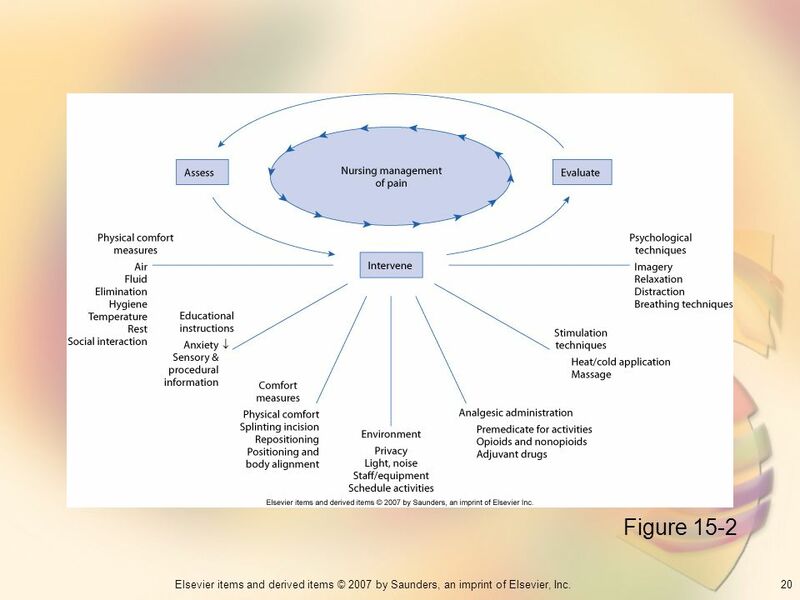 Describe interventions used in the management of pain. 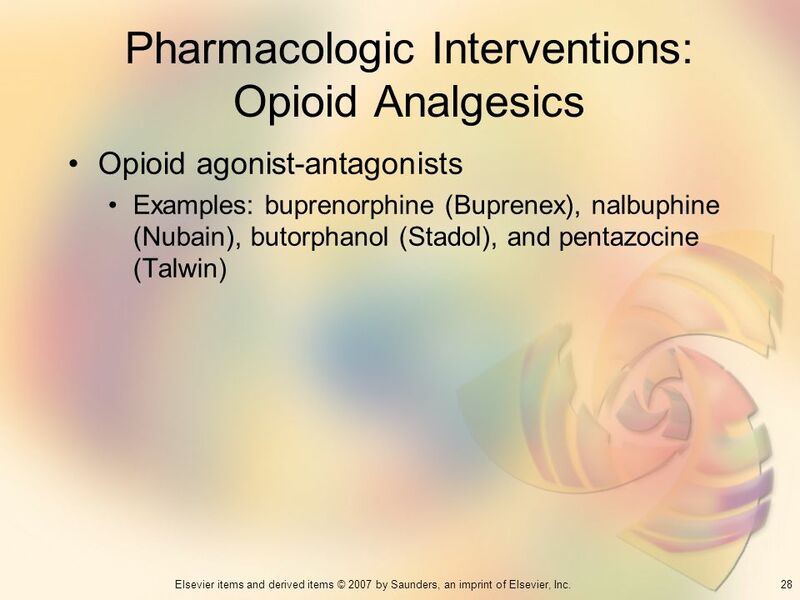 Describe the nursing care of patients receiving opioid and nonopioid analgesics for pain. 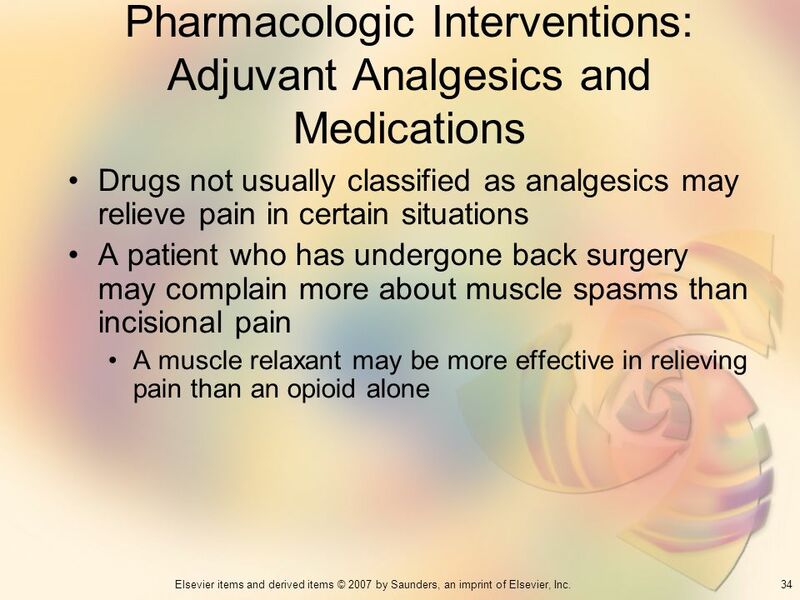 List the factors that should be considered when pain is not relieved with analgesic medications. 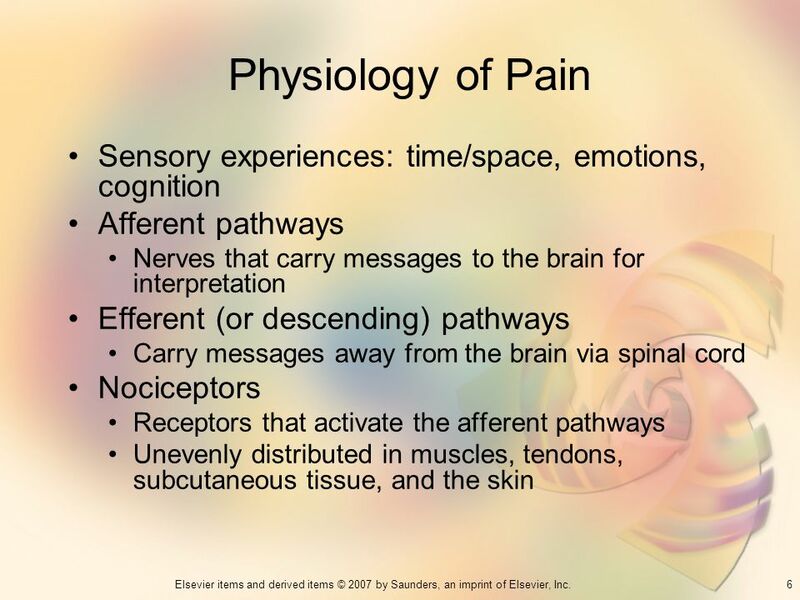 6 Physiology of Pain Sensory experiences: time/space, emotions, cognition Afferent pathways Nerves that carry messages to the brain for interpretation Efferent (or descending) pathways Carry messages away from the brain via spinal cord Nociceptors Receptors that activate the afferent pathways Unevenly distributed in muscles, tendons, subcutaneous tissue, and the skin Why are parts of the body are more sensitive to pain than other parts? 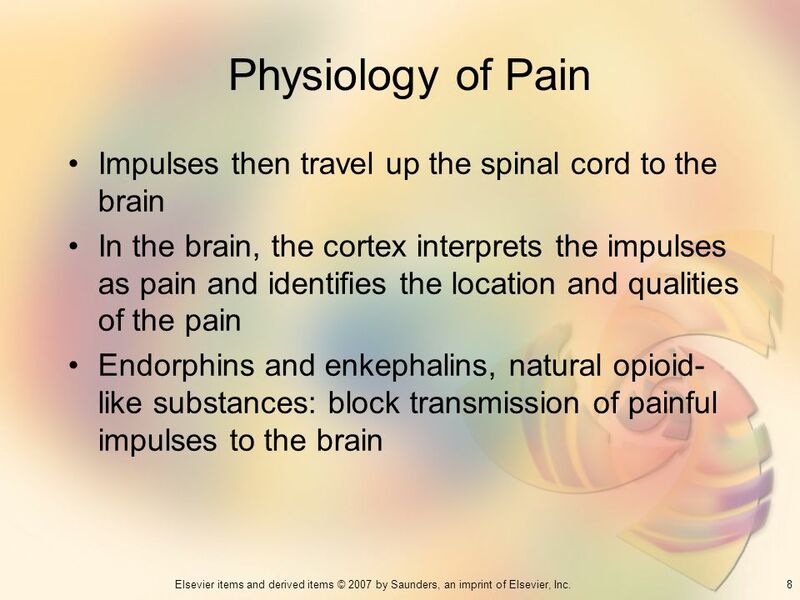 8 Physiology of Pain Impulses then travel up the spinal cord to the brain In the brain, the cortex interprets the impulses as pain and identifies the location and qualities of the pain Endorphins and enkephalins, natural opioid-like substances: block transmission of painful impulses to the brain Once pain is transmitted to the spinal cord and brain, the descending pathway is activated and several substances such as endorphins, serotonin, norepinephrine, gamma-aminobutyric acid (GABA), and enkephalins are released to inhibit pain transmission to the spinal cord. Why do some people experience more pain than others? 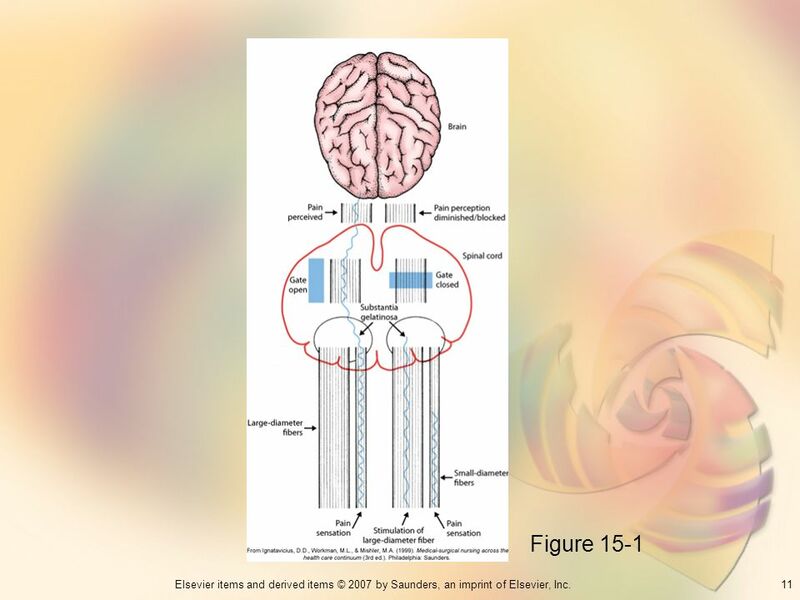 Painful impulses are transmitted to the spinal cord through small-diameter nerve fibers in the afferent pathway When these fibers are stimulated, the gating mechanism opens in the spinal cord, which permits the transmission of impulses from the spinal cord to the brain Many theories have been proposed to explain pain, but none fully describe the pain experience. Who are Melzack and Wall? 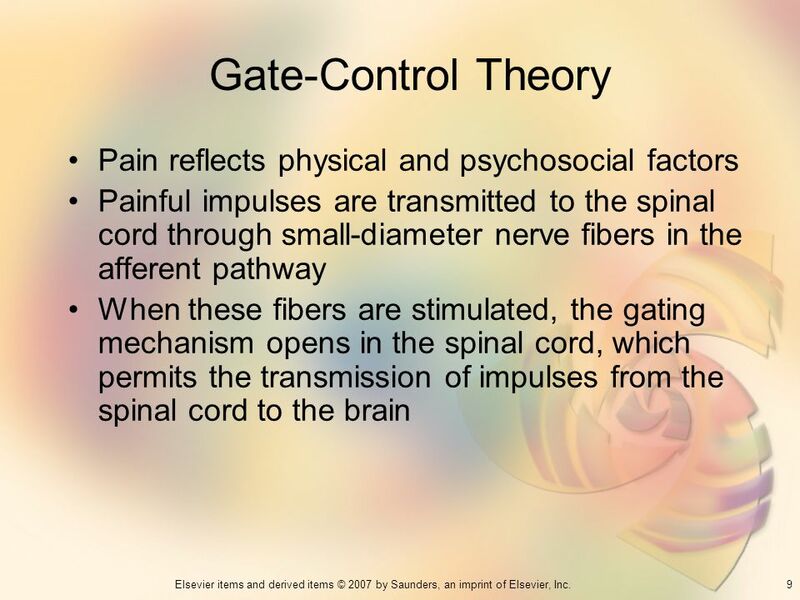 10 Gate-Control Theory Factors that cause the gate to open include tissue damage, a monotonous environment, and fear of pain Stimulation of large-diameter fibers can close the gate and interfere with impulse transmission between spinal cord and the brain, causing diminished pain perception Large-diameter nerve fibers are stimulated by cutaneous (skin) stimulation through massage, position change, and heat or cold applications. 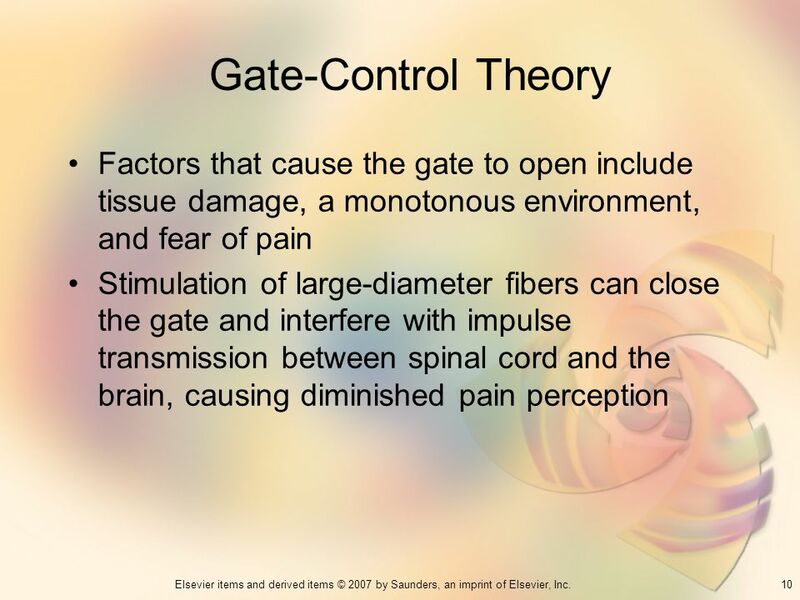 What types of sensory input may close the gate? Point at which stimulus causes sensation of pain Pain tolerance Intensity of pain that a person will endure Age Physical activity and nervous system integrity Surgery and anesthesia Type of surgery performed and the type of anesthesia used can influence the response to pain Anger, fatigue, anxiety, insomnia, depression, and uncontrolled pain all lower the pain threshold. Increasing or prolonged pain may lower the pain tolerance because the patient fears the pain will not be relieved. Pain is not a normal part of aging, but older adults often suffer from chronic conditions such as arthritis, cancer, and bone fractures that are associated with pain. How can physical activity affect pain? Some anesthetic agents injected at the operative site may prolong analgesia for 12 to 24 hours after surgery. 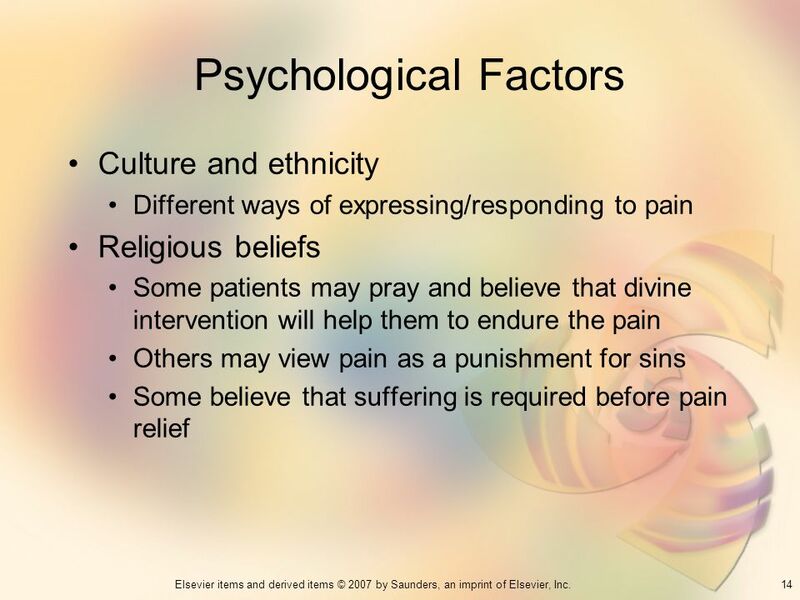 Culture and ethnicity Different ways of expressing/responding to pain Religious beliefs Some patients may pray and believe that divine intervention will help them to endure the pain Others may view pain as a punishment for sins Some believe that suffering is required before pain relief It is critical to avoid making judgments based on how you think a person should react or behave. What reactions may patients have to pain? 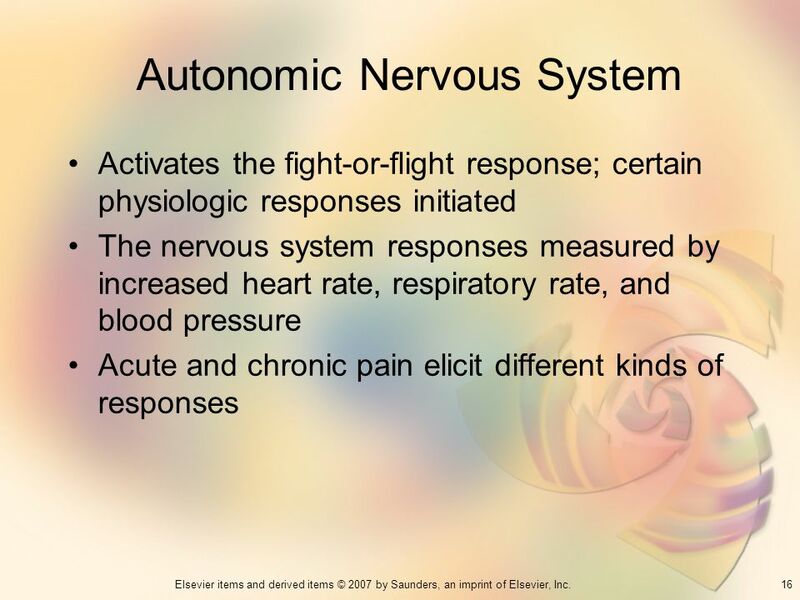 Activates the fight-or-flight response; certain physiologic responses initiated The nervous system responses measured by increased heart rate, respiratory rate, and blood pressure Acute and chronic pain elicit different kinds of responses The pain signal is interpreted by the brain as a stressor. 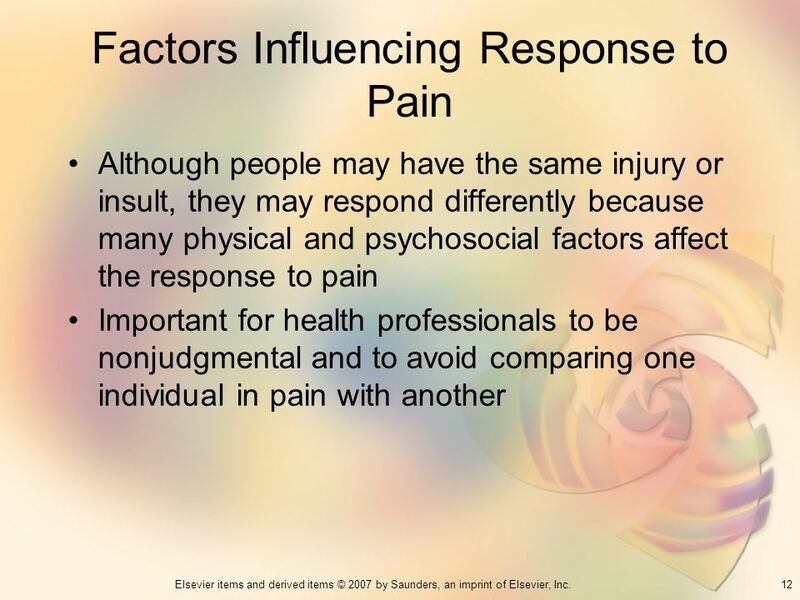 What behaviors may the patient exhibit in response to pain? Most chronic pain is neuropathic pain because it follows an abnormal pathway for pain Results from nerve damage from anatomic and physiologic conditions and underlying diseases Includes unusual sensations such as burning, shooting pain, and abnormal sensations that occur when there is no painful stimulus present See Table 15-2, p. 206 Treatment may or may not be helpful in relieving the pain. Chronic pain is associated with a variety of diagnoses, including cancer, arthritis, peripheral vascular diseases, and traumatic injuries. 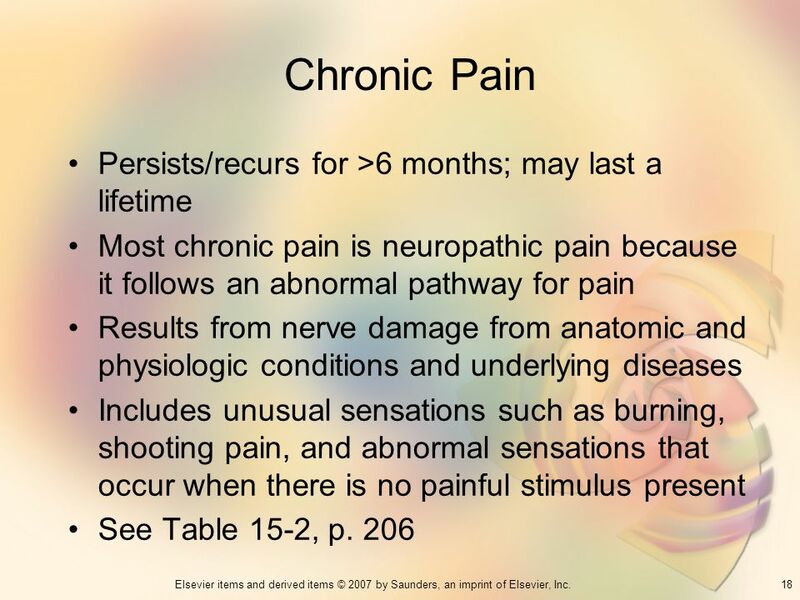 What is chronic nonmalignant or benign pain? Chronic pain serves no useful purpose; acute warns of tissue damage and trauma Nursing assessment to identify Type and amount of pain Chronic or acute If acute and chronic pain at the same time Chronic pain can lead to depression, marital difficulties, loss of self-esteem, immobility, and isolation. When the patient reports pain but shows no physical symptoms, this does not mean there is no pain. 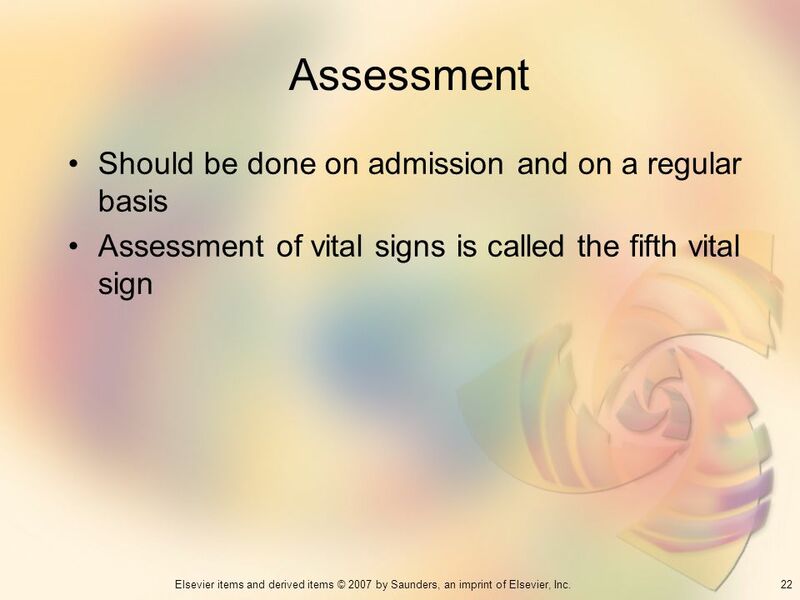 Assessment of vital signs is called the fifth vital sign Assessment is the first step in pain management. Pain should be anticipated as a result of what situations? Visual, speech, hearing, and motor impairments may limit the ability of older patients to communicate pain or to use scales to rate pain. 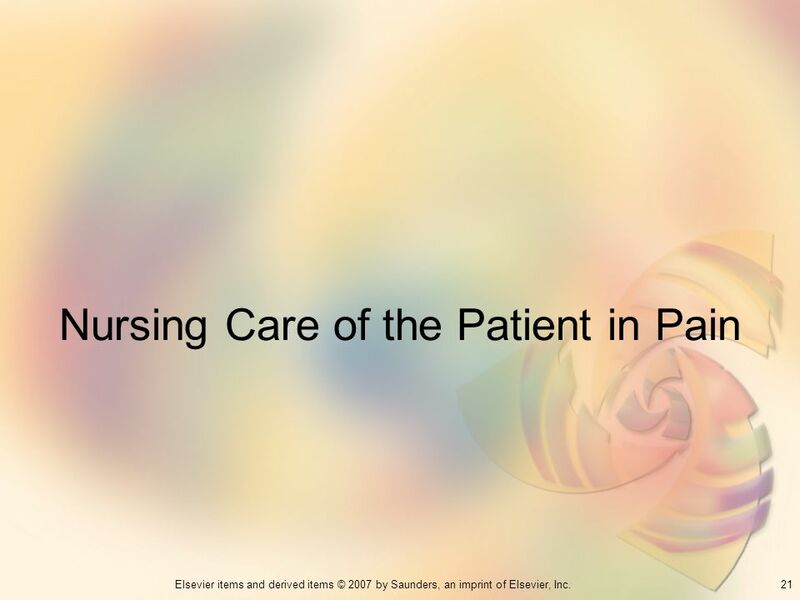 When the patient cannot report pain, the nurse may need to perform a different assessment, which includes observing for usual or unusual behaviors that may indicate pain. 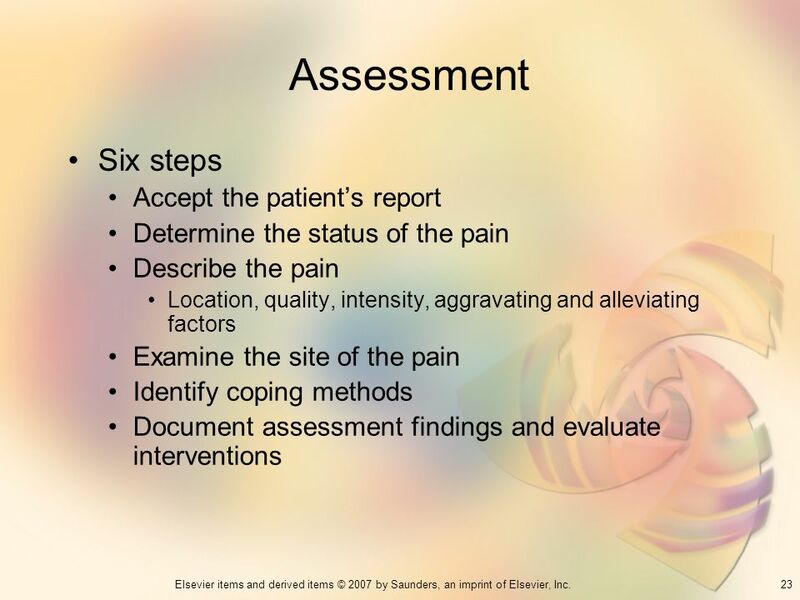 Determine the status of the pain Describe the pain Location, quality, intensity, aggravating and alleviating factors Examine the site of the pain Identify coping methods Document assessment findings and evaluate interventions Obtain specific details about the pain, and respond positively that action will be taken to relieve the pain. 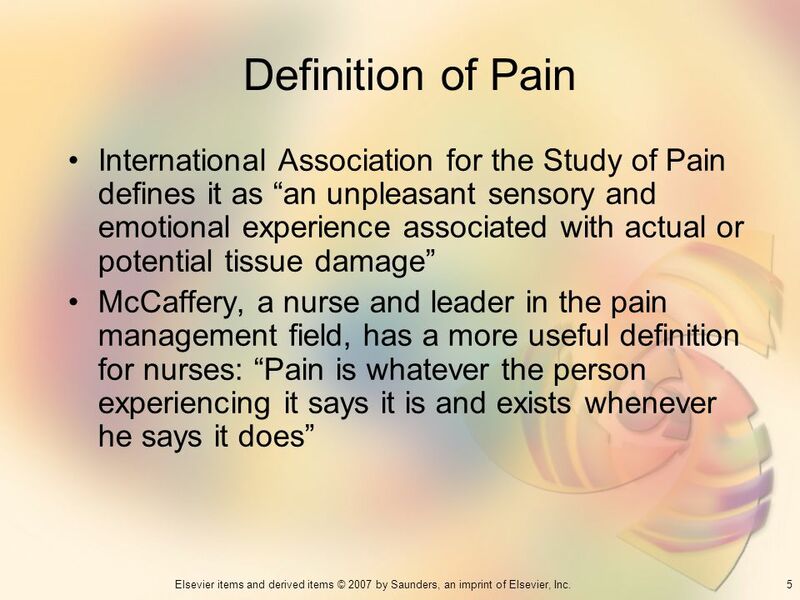 Ask the patient if he or she has had this pain before and whether it was diagnosed by a physician. Assess the area for heat, redness, swelling, tenderness, abnormal position, or other factors that may be causing local irritation. What are some coping methods patients may use? 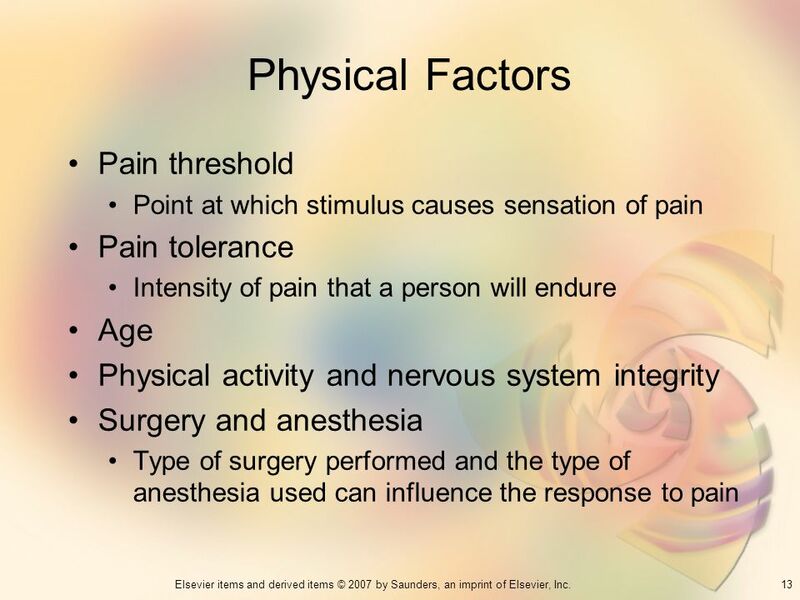 Record the location, quality, and intensity of the pain, related factors, and how the patient copes with pain. 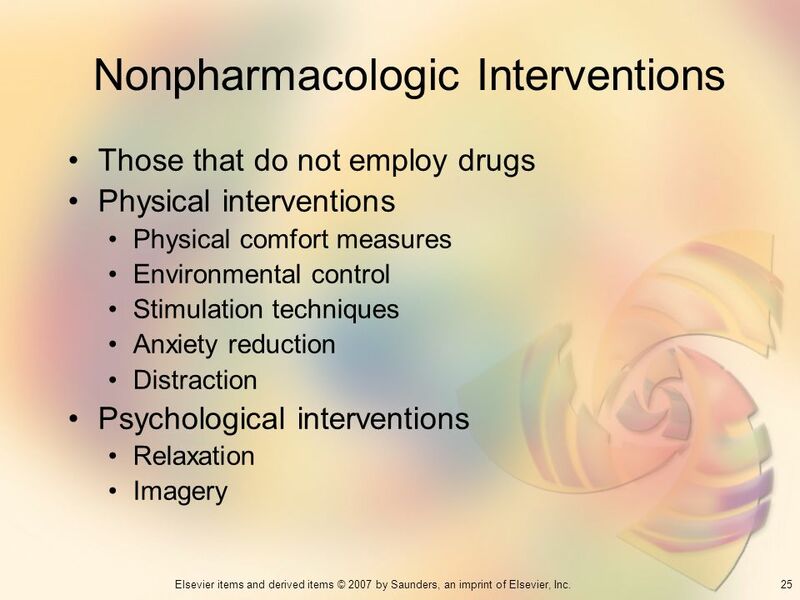 Those that do not employ drugs Physical interventions Physical comfort measures Environmental control Stimulation techniques Anxiety reduction Distraction Psychological interventions Relaxation Imagery Comfort may increase pain tolerance, and the patient may experience less pain. Stimulation of the skin and underlying tissues relieves pain. What types of skin or cutaneous stimulation can be applied to relieve pain? 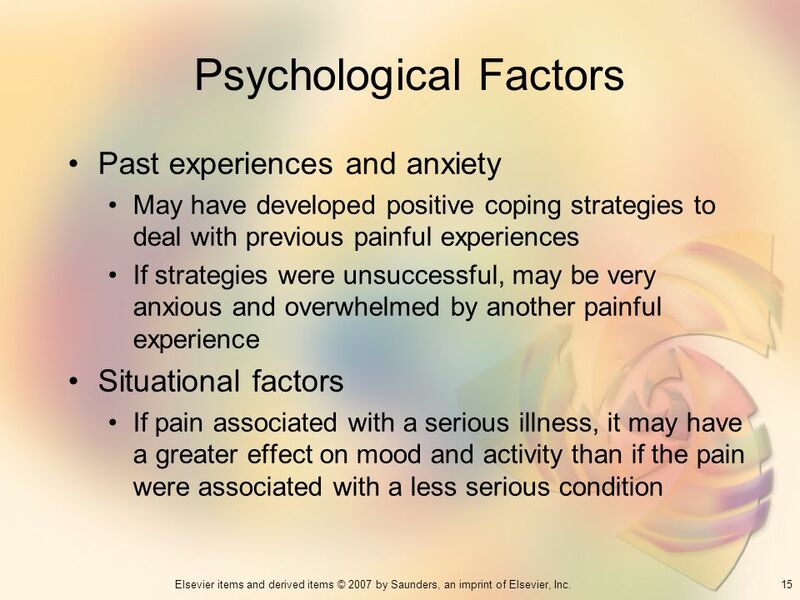 Anxiety, fear of the unknown, and feelings of loss of control may be directly related to the level of pain experienced. Distraction refers to focusing on stimuli other than pain. 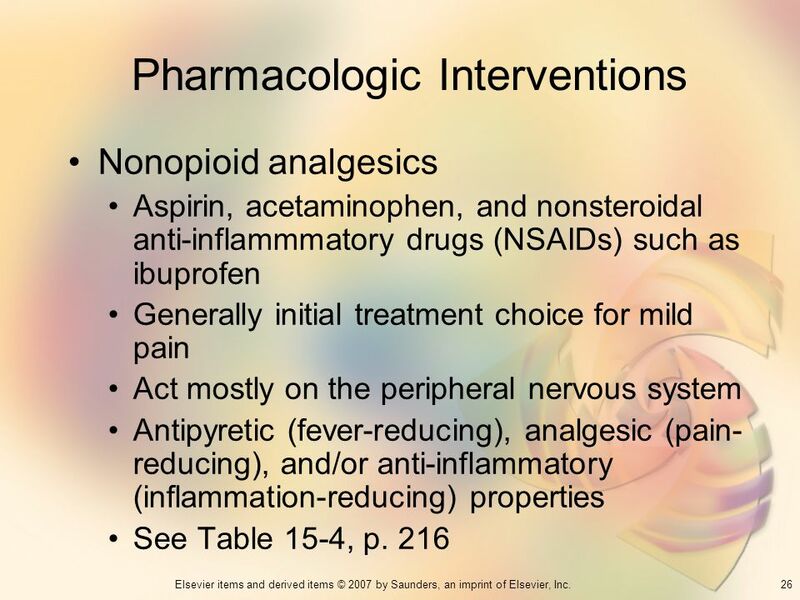 Nonopioid analgesics Aspirin, acetaminophen, and nonsteroidal anti-inflammmatory drugs (NSAIDs) such as ibuprofen Generally initial treatment choice for mild pain Act mostly on the peripheral nervous system Antipyretic (fever-reducing), analgesic (pain-reducing), and/or anti-inflammatory (inflammation-reducing) properties See Table 15-4, p. 216 When administering analgesics, keep in mind that it is critical to use a preventive approach to pain management. 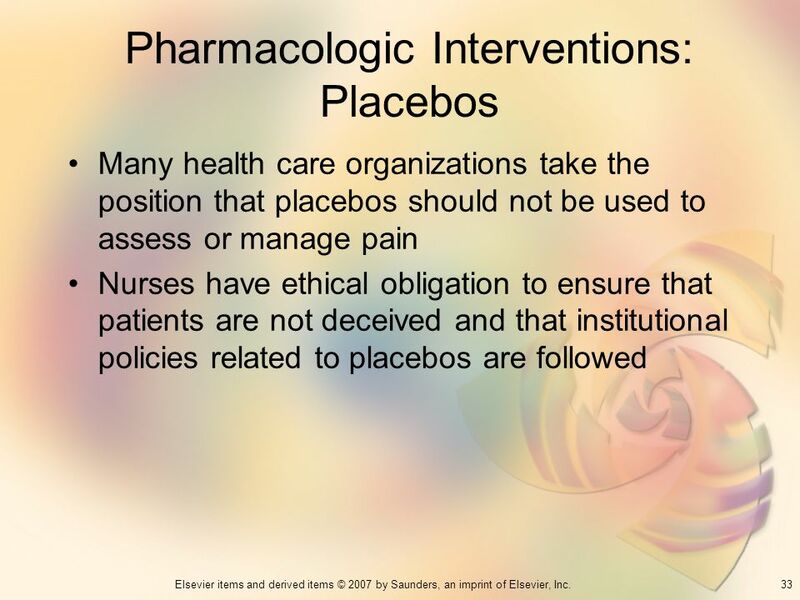 Who is responsible for assessing the pain, deciding which analgesic and how much to administer, and evaluating the drug’s effectiveness? 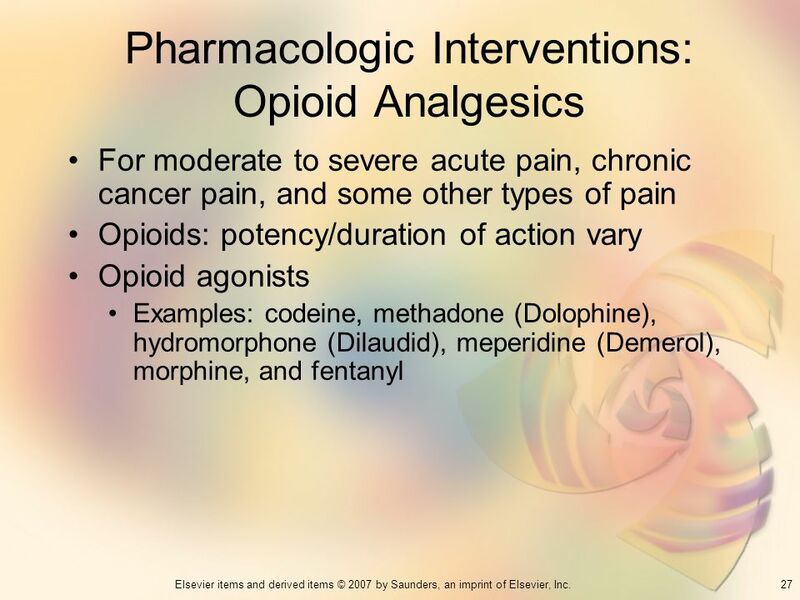 For moderate to severe acute pain, chronic cancer pain, and some other types of pain Opioids: potency/duration of action vary Opioid agonists Examples: codeine, methadone (Dolophine), hydromorphone (Dilaudid), meperidine (Demerol), morphine, and fentanyl Both types of opioids relieve pain at the level of the central nervous system. 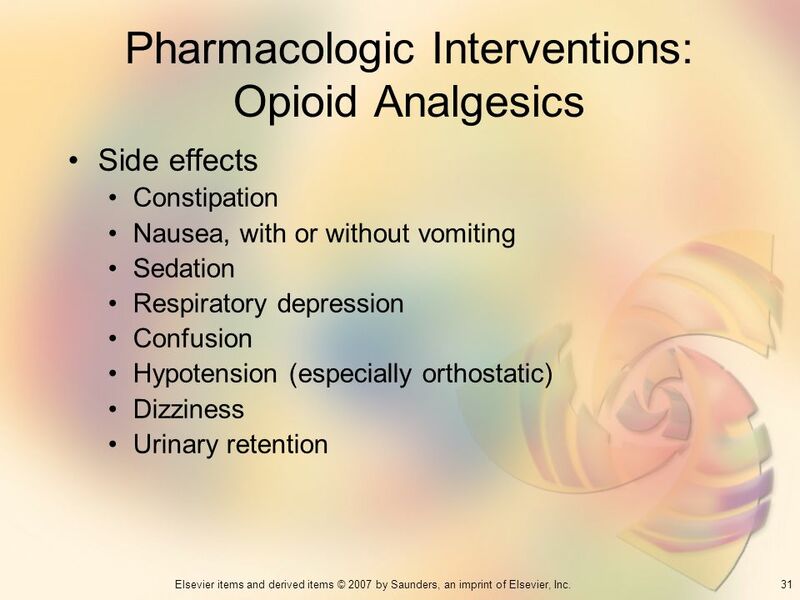 Why are older adults generally more sensitive to the analgesic effects of opioids? 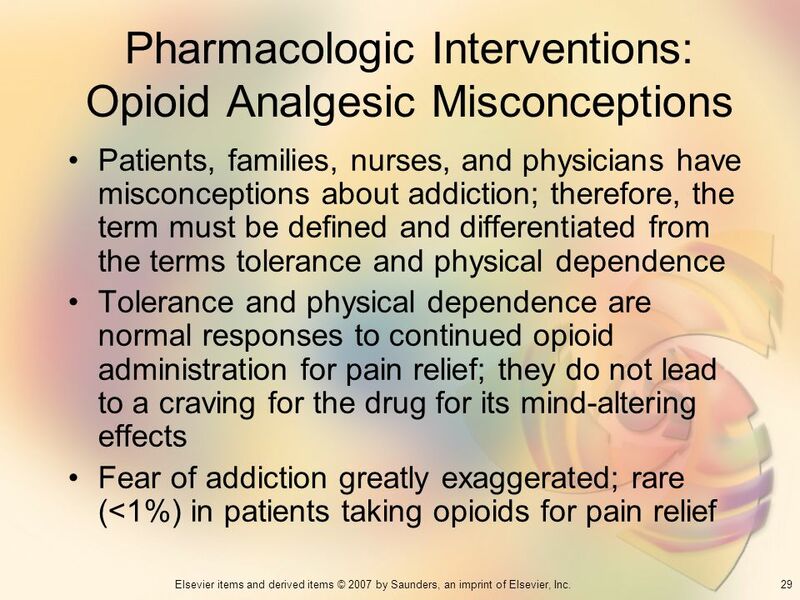 Patients, families, nurses, and physicians have misconceptions about addiction; therefore, the term must be defined and differentiated from the terms tolerance and physical dependence Tolerance and physical dependence are normal responses to continued opioid administration for pain relief; they do not lead to a craving for the drug for its mind-altering effects Fear of addiction greatly exaggerated; rare (<1%) in patients taking opioids for pain relief The patient who is tolerant requires higher doses of a drug to achieve an analgesic effect. The patient who is physically dependent on an opioid will experience unpleasant withdrawal symptoms when the opioid is stopped. 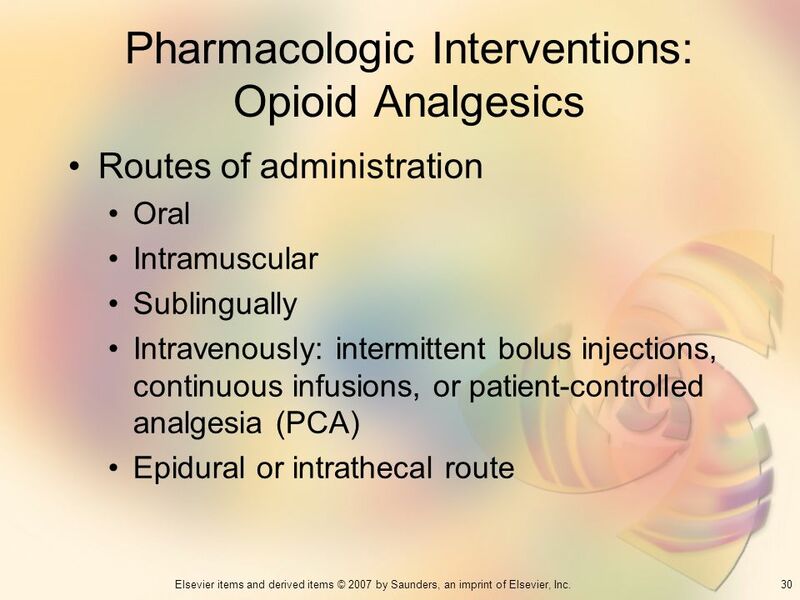 Routes of administration Oral Intramuscular Sublingually Intravenously: intermittent bolus injections, continuous infusions, or patient-controlled analgesia (PCA) Epidural or intrathecal route A limited number of opioids, such as morphine, hydromorphone, and oxymorphone, may be administered rectally. How is medication administered via a PCA pump? 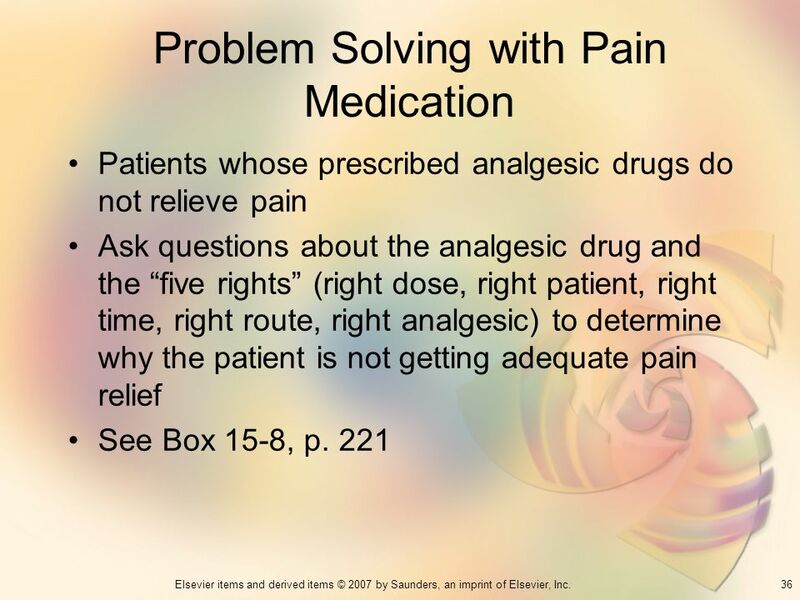 Patients whose prescribed analgesic drugs do not relieve pain Ask questions about the analgesic drug and the “five rights” (right dose, right patient, right time, right route, right analgesic) to determine why the patient is not getting adequate pain relief See Box 15-8, p. 221 The administration of analgesics is simply one intervention in the nursing care of a patient in pain. 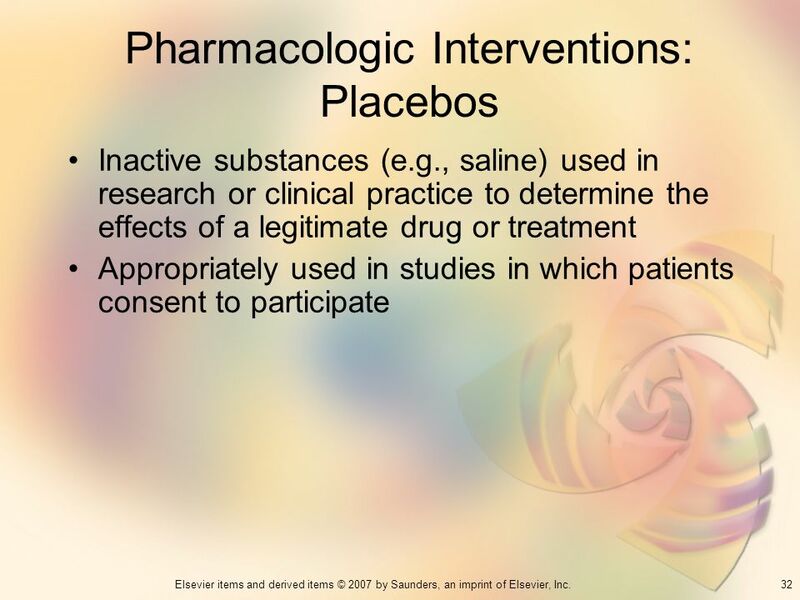 What interventions other than analgesics should the nurse provide? 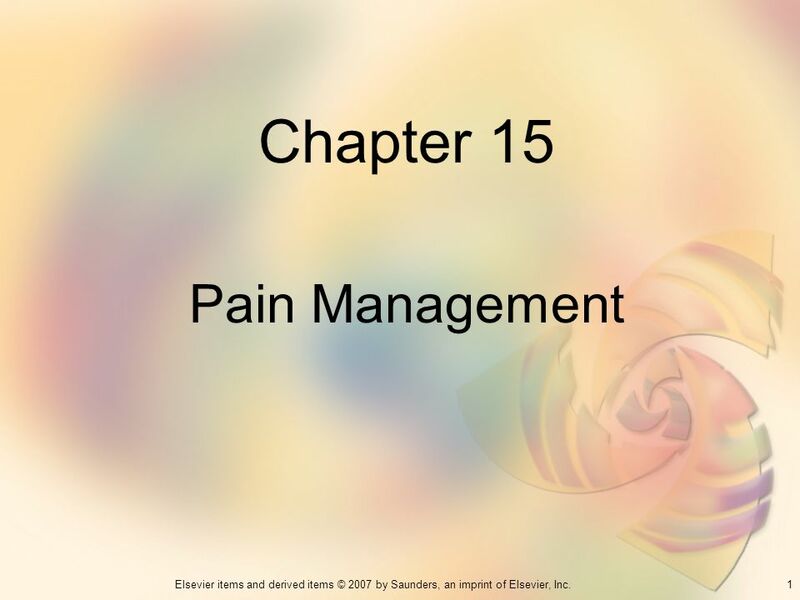 Download ppt "Chapter 15 Pain Management." Health Psychology Third Edition Chapter 13 Managing Pain. Sarah Derman, RN, MSN Clinical Nurse Specialist: Pain Management Fraser Health: Surgical Program October 26, 2013. Chapter 10 Comfort and safety Chapter 10 Comfort and safety 中国医科大学护理学院 曹 颖 曹 颖. 1 Pain. 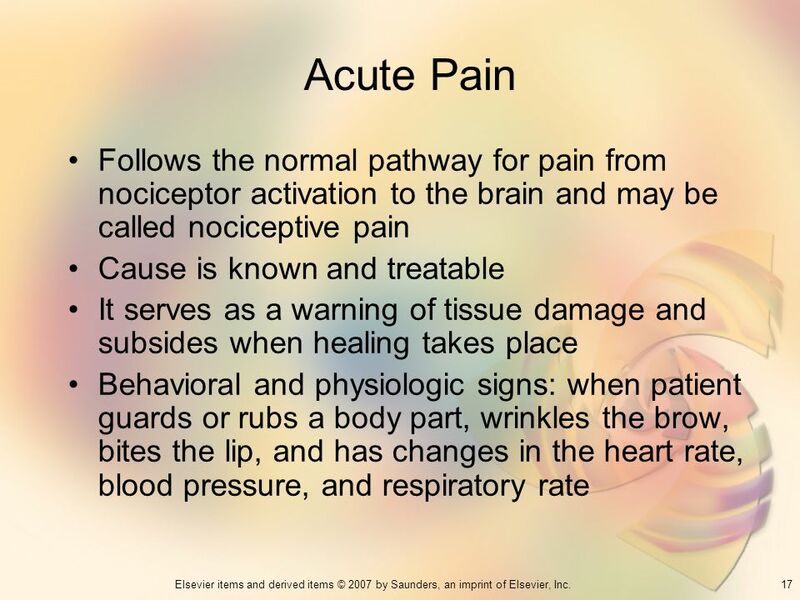 2 Types of Pain Acute Pain Acute Pain –Complex combination of sensory, perceptual, & emotional experiences as a result of a noxious stimulus –Mediated. Anxiety and Pain Control DH 301 Clinic V By Judy Valdez 3-13. 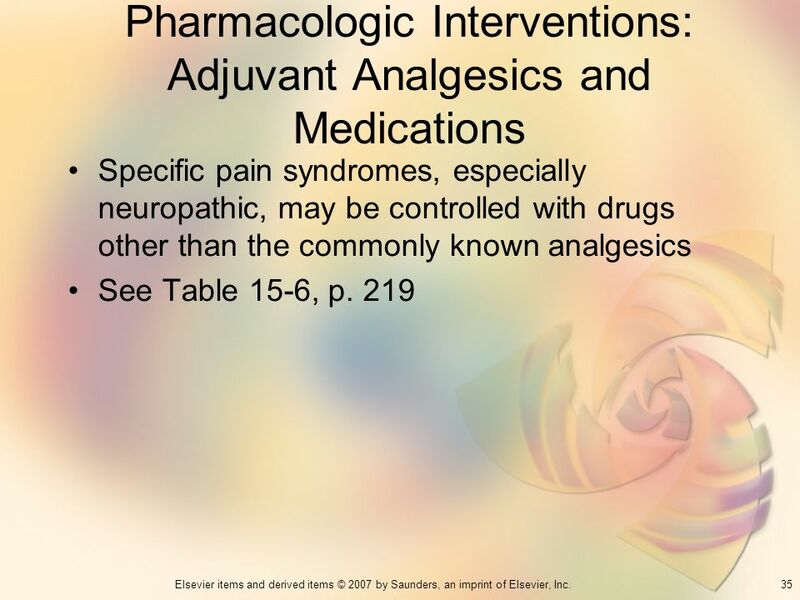 1Elsevier items and derived items © 2007 by Saunders, an imprint of Elsevier, Inc. Chapter 15 Pain Management. Copyright © 2009 Wolters Kluwer Health | Lippincott Williams & Wilkins Chapter 05: Relieving Pain and Providing Comfort. Linda S. Williams / Paula D. Hopper Copyright © F.A. Davis Company Understanding Medical Surgical Nursing, 4th Edition Chapter 10 Nursing Care of. # Lab 3#. 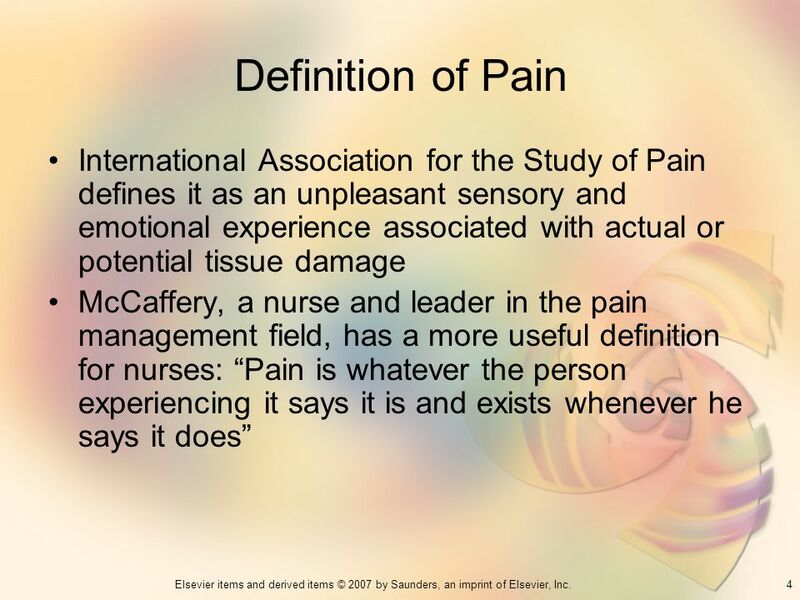 Introduction - Pain: an unpleasant sensory and emotional experience associated with actual or potential tissue damage, or described in terms.